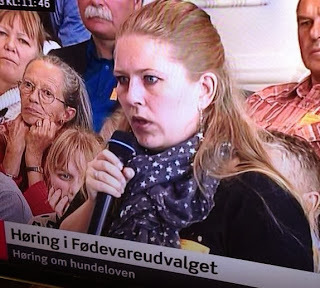 There were many presentations from veterinarians, animal ethical council, the Danish Kennel Club, Karen Hækkerup etc. following questions from the politicians we (the members of the audience) were allowed to ask questions. Briefly told the experts agreed that the ban is not the way forward however the problem is at the other end of the line, it is the owner. Nothing suggested that the breeds that are banned are more aggressive than others and this was underlined. Despite this, Karen Hækkerup chose persistently to maintain the breed ban supported by: Vibeke Knudsen from Danish Kennel Club. It may be said that Vibeke does not have any real education in the dog world, she is only their marketing correspondent and hereby I mean that she is not to be considered as an expert. Unfortunately we did not see much of Karen Hækkerup. As she was not present to the first three presentations, she was only present shortly speaking about her own position towards the ban, that by the way was not supported by any facts or experts. She briefly answered some question and here by left. So to say she did not stay to the experts statements. One of the statements that rouse my attention was that they all kept saying that there were none existing statistics concerning bites, reports etc. in Denmark. Both Fair Dog and Danish Terrier Clubs BIGcommittee have maid several in-depth studies and Fair Dog does also work with cases where people have been struck with the breed ban prior to race or by savage act. therefore wonder why they are not present in the committee as they have expert knowledge that they use daily unlike others. Conclusion Karen Hækkerup chose not to listen to expert knowledge and this is only a reiteration from when the law was approved. Yet again populism is more important then FACTS.